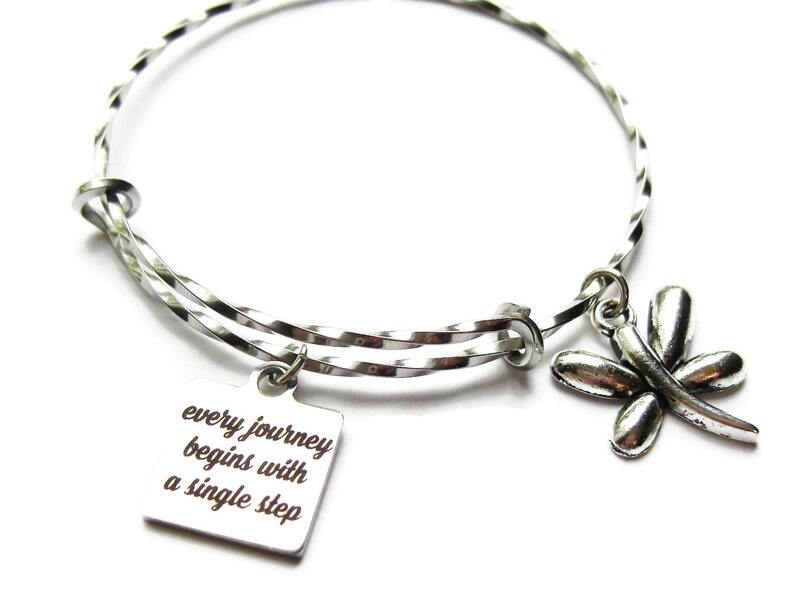 Inspirational bracelet. Graduate gift. Twisted Stainless steel gives this strong bracelet a sparkly look. Pair with a Companion Bangle here. See other Adjustable Bangle Bracelets here. See other Leather Suede and other bracelets here. See Leather and Faux Suede Wrap bracelets here. See Earrings and Necklaces here. Visit my shop often for new additions all the time! Please add my shop as a ♥FAVORITE♥ so you can find me! VETERINARIAN Adjustable Bangle, Charm Bracelet,Stainless or Sterling Silver bangle, One Size Fits Most! Diane customized this for me exactly how I wanted it. I love it. It’s perfect! PHYSICAL THERAPIST Adjustable Charm Bangle, Nurse bracelet, Charm Bracelet,Silver Plated bangle, One Size Fits Most! For your convenience we accept paypal and credit cards through Etsy's Direct Checkout. Payments may be made via Etsy's Direct Checkout feature or via PayPal... please note that you are not required to have an account with PayPal to make a payment! Packages will be sent once payment has been received. If payment has not been received after 4 days, the transaction will be canceled and the item will be relisted. If you are having difficulties paying please contact me. Your satisfaction is my goal. If you would like a refund for any reason, please contact me within 5 days from the arrival of your purchase, and I will issue you a refund once I have received the returned item. Returned items must be in the same condition I shipped them in or refunds will not be issued. Shipping costs are not refundable. I will fix or exchange any broken items up to 30 days from the date the jewelry arrived. Due to hygiene guidelines I cannot accept returns on earrings. Please contact me before leaving neutral/negative feedback, so I may have a chance to correct any problems you may have with your order. Your satisfaction really does matter to me. Thank you for your business! Click here to return to my shop. I currently have a 2-3 day turn around time for U.S. orders. During the holiday times lead time may be slightly longer. Peak times during but not limited to: Valentines Day, Mother's Day and Christmas. FYI- IMPORTANT - I use the address you have with Etsy to ship your order! So be sure it is correct!! -I only ship to the address listed during checkout on Etsy, not on PayPal. -Please do not leave any instructions in Paypal- I won't see it! Please write any special instructions in the section during checkout on Etsy. Or, just send a convo. **IF you’ve already made your purchase and you would like to upgrade to get it there faster just purchase the appropriate SHIPPING UPGRADE listing in my shop and I’ll get your order out to you faster. Please note: International orders may take up to 6 weeks to arrive at their destination. I ship worldwide to countries that accept PayPal. International buyers are required to pay on Etsy with paypal or direct check out and I am required by paypal to send them the item by mail. No exceptions. International orders will be shipped within 2 days via USPS First Class Package International Service. I charge a flat rate for International Shipments and I will refund through paypal any shipping cost overages of $1.00 or more. By law, I am required to mark international parcels as 'merchandise' and to claim the actual retail value on the customs form, so please don't ask me to do otherwise. We do not mark merchandise values below value or mark items as gifts. U.S. and International government regulations prohibit such behavior. Buyers are responsible for any customs and import taxes that may apply. Sellers aren't responsible for delays due to customs. Any orders shipped out of the U.S. can be subject to import customs duties, taxes and brokerage fees which are payable by the recipient (customer) upon delivery. Unfortunately, I can't tell in advance what these charges will be as they are established by your own country's customs department. These charges are normally collected by the delivering freight or shipping company or when you pick the item up. You are responsible and legally obliged to pay any and all import duties, taxes and/or brokerage charges that are incurred on the package you receive. It is your full responsibility to verify the customs, duties charges and procedures prior to placing your order. You can find more details on these duties and taxes from your country's Revenue Website. In the UK it is at the official HM Revenue and Customs Website. As a US based shop, LadybugfeetDesigns is unable to legally do trade with customers in the countries of Cuba, Iran, Myanmar, Sudan, Syria or North Korea. Any orders from these countries will be refunded and cancelled. => Color cords vary slightly from pictures according to the spools I receive. => Any metal from colored / plated to Sterling silver will tarnish to some degree at some point - I do not offer cleaning / fixing this natural occurrence, however, a silver / metal liquid cleaner works well. There is a great product called JEWELRY SHIELD that can be purchased on Amazon as a coating for plated jewelry that prevents tarnish and metal allergies. I highly recommend it!